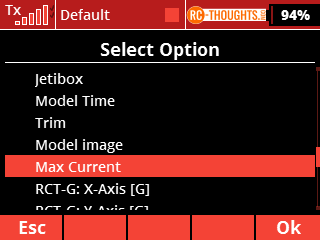 Small app for those who’s ESC does not provide max current as a telemetry value and are too lazy to open logs. or just simply wants the value on main screen. Done due a request by a user on Helifreak-forum. Settings are simple. 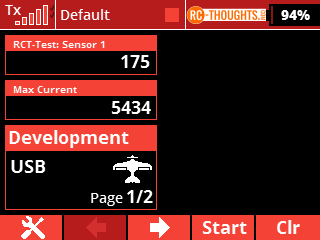 Select correct sensor (your current-sensor) and assign a reset switch. Reset-switch resets the max current value to zero is there is no sensor available and switch is used or if sensor-value is zero and switch is used. 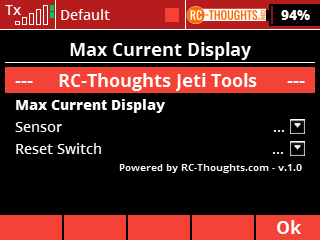 You can for example use a telemetry-switch to this to have max current reset automatically. Max Current is 5434 and current value is 175. To reset Max Current the switch needs to be used and current value needs to be zero or sensor needs to be powered off.